There can be few more beautiful places to start a coastal walk than the 700 berth Royal Harbour Marina. 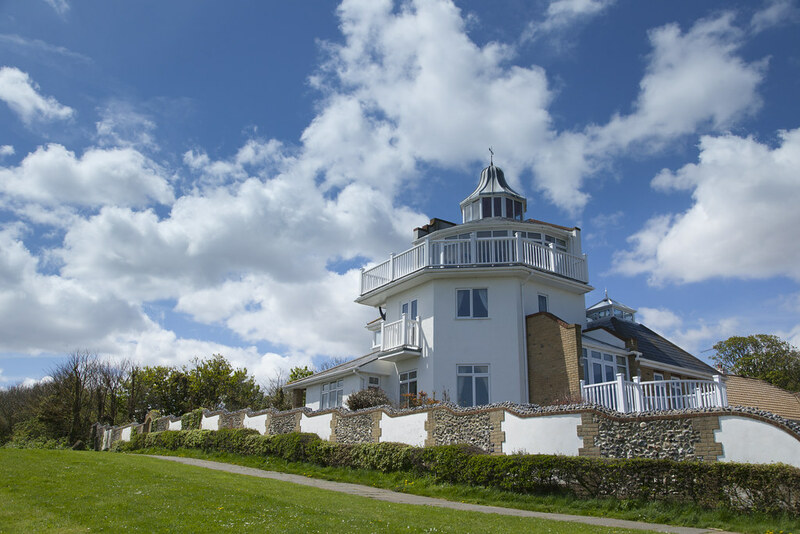 Just 35 miles from the French coast and a skip and a hop away from attractions like the Sailor’s Church, Jacob’s Ladder in Military Road, the RNLI Lifeboat Station and the Royal Temple Yacht Club, almost everything you want to see is within easy reach. 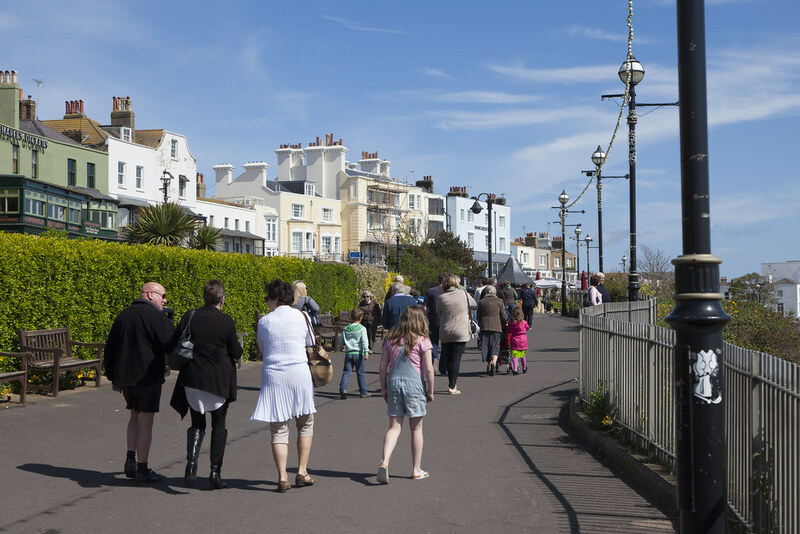 Some of the cosmopolitan attractions lining the picturesque waterfront are also Active Ramsgate partners with a range of exclusive offers and discounts. 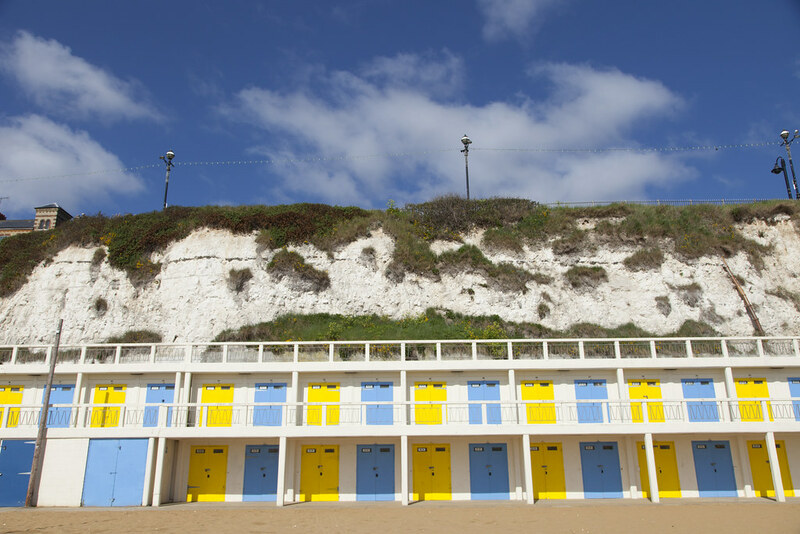 Enjoy cafes like the unfailingly warm and stylish Miles Bar on the harbour front and the aptly named Nice Things bijou gallery, craft and gift shop, inside The Custom House on the harbour side Broadstairs Cafe. 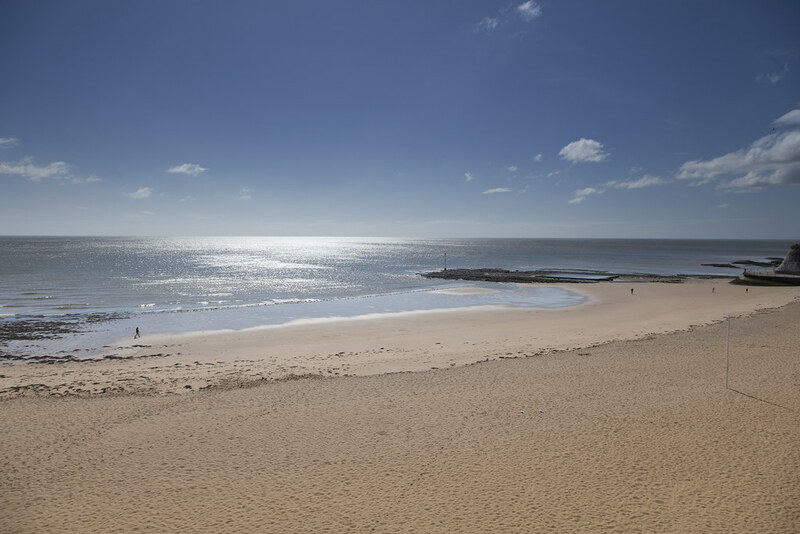 But don’t get too comfortable because there’s a lot to enjoy and see as you pick up the Thanet Coastal Path, pass the Royal Victoria Pavilion and Ramsgate Sands and (at high tide) head on to King George VI Memorial Park. 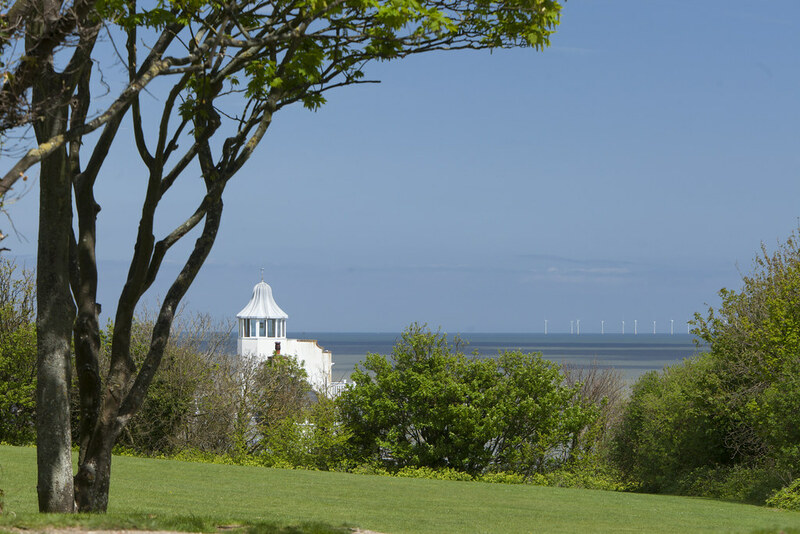 Large, grassy, and much beloved by dogs and their walkers, this all season attraction (originally the site of Sir Moses Montefiore’s home, East Cliff Lodge), can give a sense of wonderful seclusion, despite being only a few minutes gentle amble from the harbour. On your right, the channel and (on a good day!) a truly spectacular view of the French coastline. 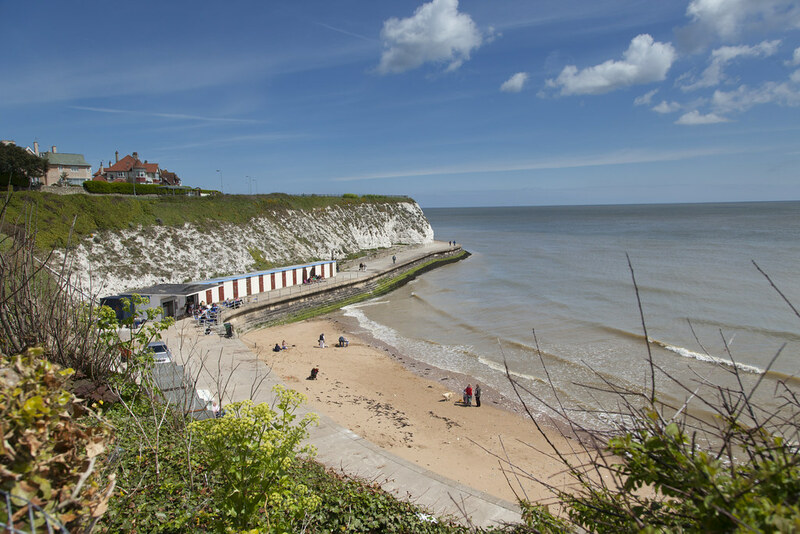 Depending on the tide, you can either follow the route up on to the cliff top or down on to the beach at Dumpton Gap where you will be rewarded with some stunning views – and a refreshing drink from a seasonal kiosk. As you leave the Ramsgate Harbour area and the eclectic mix of restaurants, cafés and pubs overlooking the inner yacht marina, you will pass the former Royal Victoria Pavilion and the old Harbour cliff lift and head towards the blue building which is the boulevard kiosk. A small fun fair, offering merry-go-round, swing-boats and other old style fair rides, is set out on the beach in front of the kiosk and there is ample outdoor seating. A little further on and Ramsgate's Sea Garden will come into view; a small garden inspired by the coastal environment that lies on the site of the old Marina swimming pool and boating lake. You might appreciate a small breather by now. There is an interpretation panel and a bench you can use to enjoy the view out across the sandy beach and the sea. 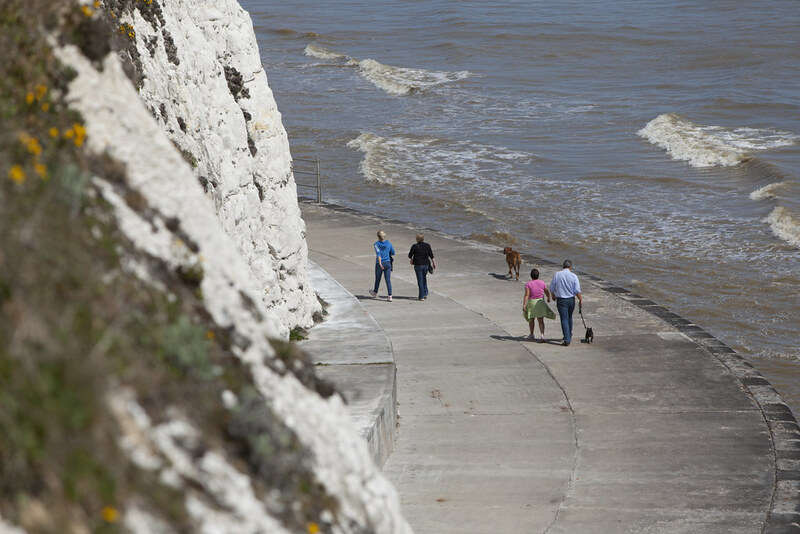 The sea wall runs directly along the foot of white chalk cliffs at this point and approximately 200 metres further on you will reach a switch-back path up to the cliff-top. 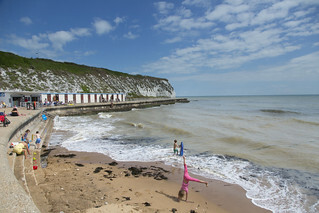 At high tide, follow this route to continue the walk to Broadstairs. You can return to the beach or sea wall at Dumpton Gap. 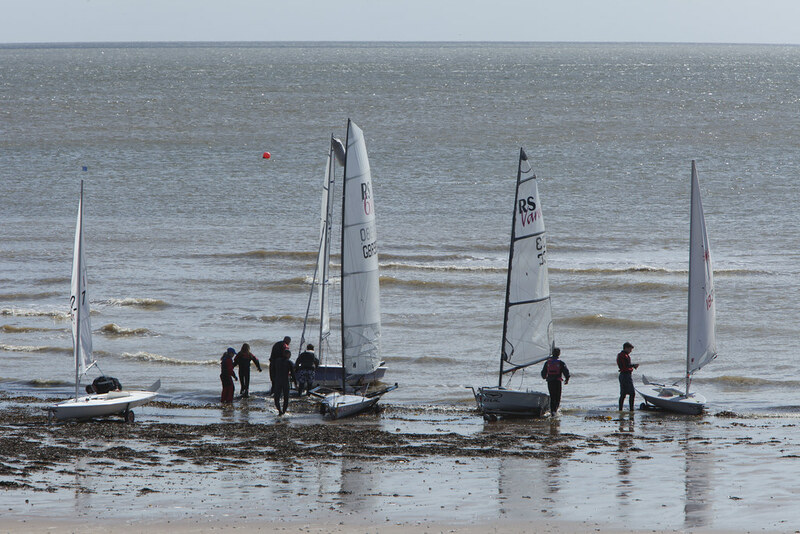 When the tide is low, you can continue along the sea wall, for another 450 metres, before reaching a ramp that leads you down onto the sandy beach. 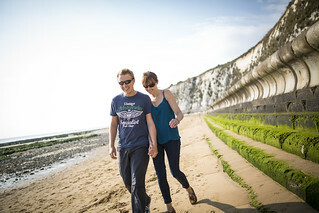 This section of the walk offers you some truly stunning views of the channel, with the imposing white cliffs on your left and the multitude of chalk rocks, worn smooth by the daily tides, strewn at the cliff's base. But remember that there is no sea-wall to escape to if you get caught out by the rising tide, so plan ahead. 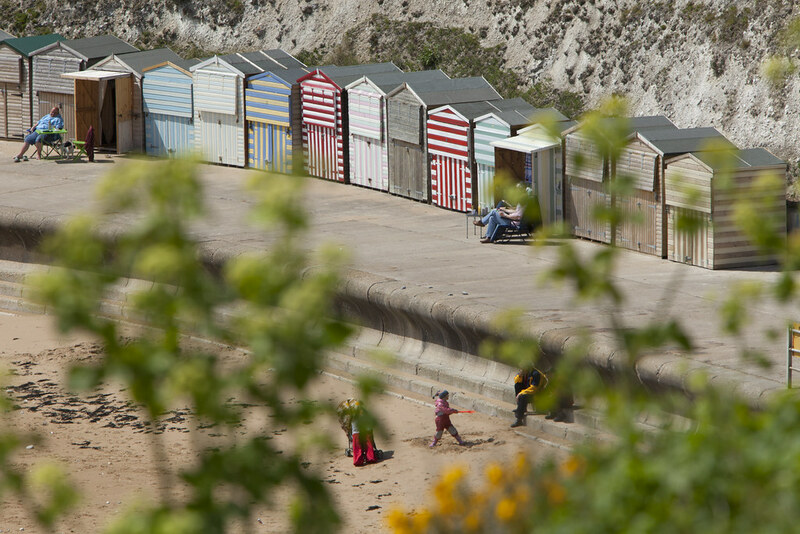 After approximately 630 metres, another ramp will lead you off the beach; up past a row of brightly coloured wooden beach huts and back on to the sea-wall at Dumpton Gap, where a seasonal kiosk serves refreshing hot and cold drinks, snacks and ice creams. Public toilets (including baby-change facilities) are also available here. 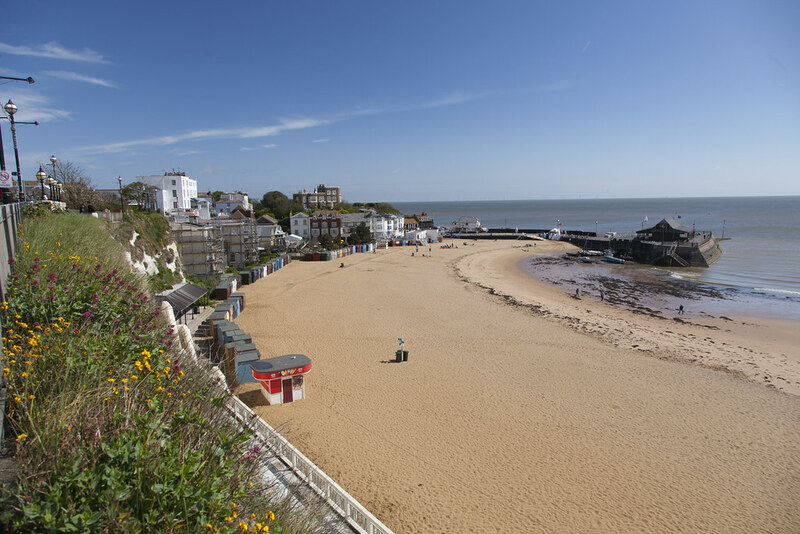 Follow the sea wall's final bend into Louisa Bay and you will be rewarded with some fantastic views of Broadstairs and a chance to walk along the beach at low tide from Dumpton Gap. Thanks to a series of steps that lead from the beach up to the sea-wall, you can quickly retreat to safety if the tide catches you by surprise. At the Louisa Bay cafe (seasonal) a ramp will lead you uphill, under the footbridge and onto a set of steps to the cliff top. Turn left at the top of the steps and you will enter Victoria Gardens, a circular park with a path you can follow in either direction towards the bandstand. There are toilets and baby change facilities here if you need them. From here you can join the promenade, where there are more interpretation panels and benches you can use to rest and take in the view across Viking Bay. If you've worked up an appetite, you can also stop off for a bite at the Charles Dickens pub, Royal Albion Hotel, Prezzo or Chiappini's (amongst others). 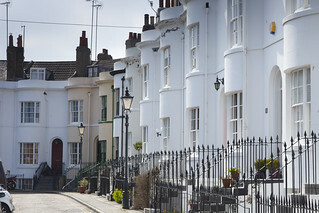 Follow the path as it slopes down to the junction with Harbour Street, turn right and continue, downhill, past Wyatt and Jones, the Sun Terrace, Pavilion Gardens and the Tartar Frigate Public house. (There are more public toilets available here). When you reach The Boathouse, turn right onto the pier, find a bench or grab a welldeserved drink and snack from the kiosk at the end (seasonal). Now you can retrace your steps back through Victoria Gardens to the steps by the footbridge but instead of taking the steps down to the sea wall, continue across the bridge and follow the path along the top of the cliff. There are a number of additional benches available here that you can use to enjoy the space and tranquillity of the wide grassed “Leas” area between you and the Western Esplanade. There are also two interpretation panels at South Cliff and panoramic views, over Dumpton Gap, back towards Ramsgate Harbour. 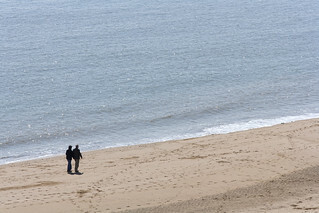 Continue straight on or return to walk along the beach to Ramsgate - if the tide is favourable (low tide only). At high tide take the cliff-top section of the ‘paved' path that finishes shortly after Dumpton Gap and continue on short grass for approximately 450 metres. Just follow the Leas and head towards the converted lighthouse in the distance. You are nearly there, so enjoy these final sights as the trail leads you back to a surfaced path (also the Viking Coastal Trail) beside the lighthouse, where you can continue on through the King George VI Memorial Park. 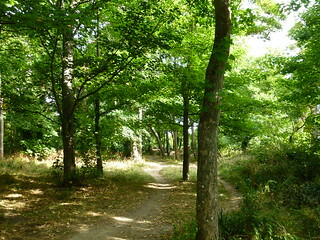 You'll find an excellent children's playground, a café and some toilets near the exit at the far end of the park. 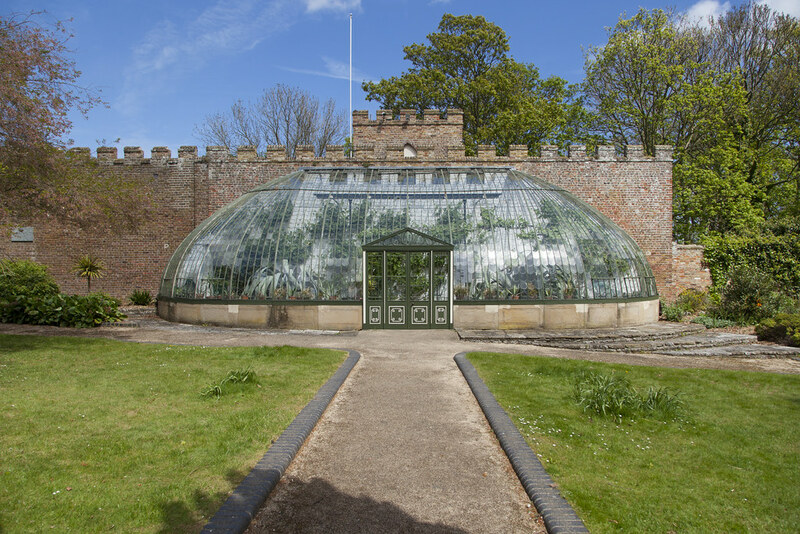 Be sure to take a short detour into the park to view the Italianate Greenhouse. Now turn left out of the park gates, follow the path along the top of the East Cliff, pass the top of the switch-back path and head towards the Granville Theatre. 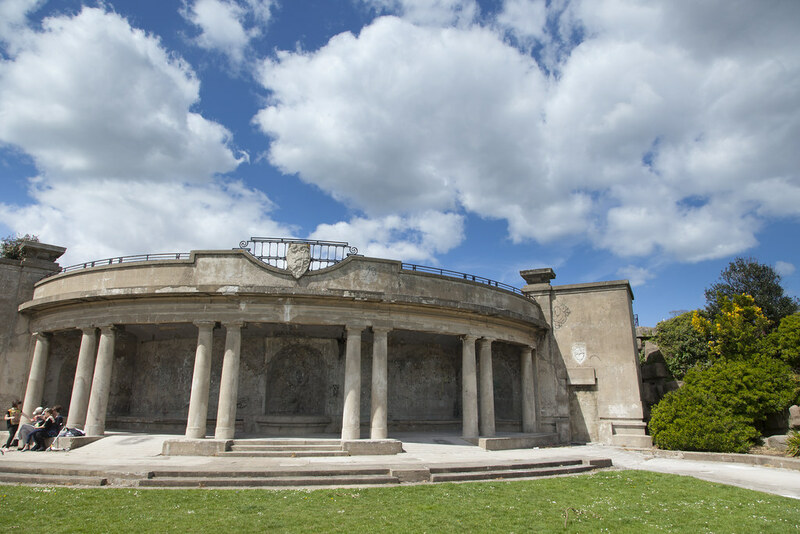 Look out for some attractive ‘Victorian style' shelters dotted along the East Cliff on the way. The top entrance to the Harbour cliff lift is now on your left with the path running adjacent to Madeira Walk as it begins its gentle descent to the harbour. You know you are on track when you see the Albion Park gardens on the opposite side of the road. A few moments more and you have arrived at the bottom of the hill and back at the Ramsgate Harbour/ Yacht Marina.